This charming country home has a low maintenance exterior and timeless style. The three car garage offers extra storage space for a workshop or lawn equipment. Inside, the main floor is filled with custom-styled details. Adjacent to the kitchen is a walk-in pantry and a handy e-space with a window, as well as a spacious dining room. The great room features an elegant coffered ceiling and fireplace. 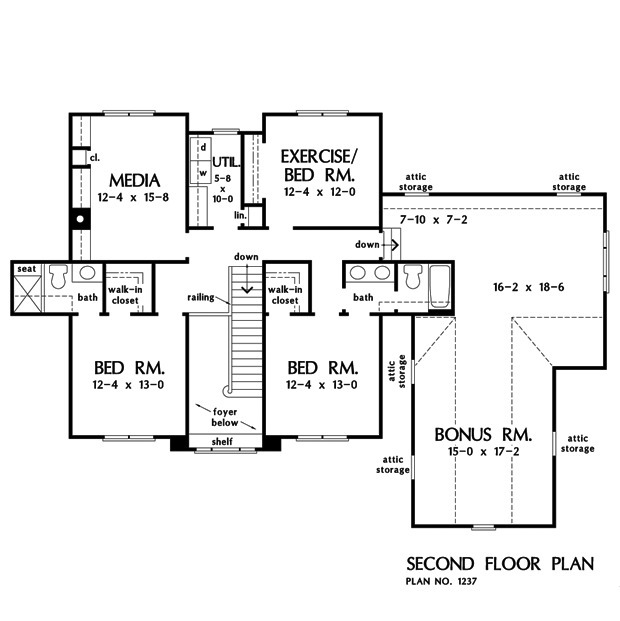 The large master bedroom includes a tray ceiling, dual walk-in closets and access to the rear porch. The master bathroom combines luxury and convenience with a large shower and private access to the utility room. 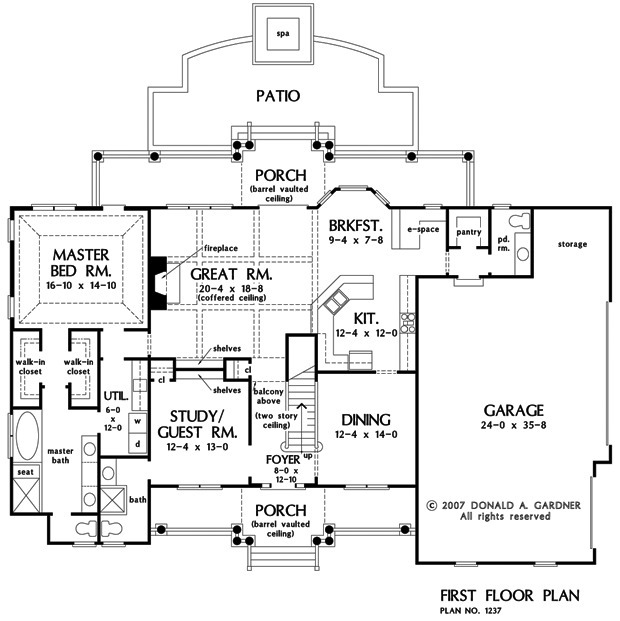 1st Floor: 2070 Sq. Ft.
2nd Floor: 1145 Sq. Ft. Bonus Room: 670 Sq. Ft.
House Dimensions: 75' 8" x 53' 5"
Great Room: 20' 4" x 18' 8"
Bedroom #2 : 12' 4" x 13' 0" x 9' 0"
Bedroom / Study : 12' 4" x 13' 0" x 10' 0"
Bonus Room : 15' 0" x 17' 2" x 9' 6"
Breakfast Room : 9' 4" x 7' 8" x 10' 0"
Dining Room : 12' 4" x 14' 0" x 10' 0"
E-Space : 5' 10" x 5' 0" x 10' 0"
Foyer : 8' 0" x 12' 10" x 20' 1"
Garage : 24' 0" x 35' 8" x 0' 0"
Garage Storage : 9' 6" x 8' 8" x 0' 0"
Great Room (Coffered): 20' 4" x 18' 8" x 10' 0"
Kitchen : 12' 4" x 12' 0" x 10' 0"
Master Bedroom (Tray): 16' 10" x 14' 10" x 12' 6"
Media Room : 12' 4" x 15' 8" x 9' 0"
Other : 5' 8" x 10' 0" x 9' 0"
Other #2 : 12' 4" x 12' 0" x 9' 0"
Patio - Rear : 34' 0" x 14' 6" x 0' 0"
Porch - Rear : 48' 0" x 7' 0" x 10' 0"
Porch - Front : 33' 4" x 6' 0" x 10' 0"
Utility Room : 6' 0" x 12' 0" x 10' 0"